They’ve applied this and their Zero Suspension System, as well as a dual-link design with the shock floating between the two suspension links and compressed from both ends. This design makes the rear suspension extremely sensitive on small bumps, while at the same time being capable of big hits. It also enables the bike to be more stable while pedaling and have minimal chain growth throughout the suspension travel. 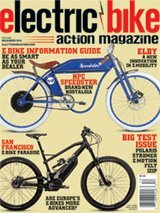 Talk about some e-bike enthusiasm; when Mondraker jumped into the pedal-assist game, they didn’t with just one or two models. No. They have an entire line of off-road e-bikes starting with simple hardtails and all-mountain bikes up to the plus-sized full-suspension bikes, and finally the e-Panzer R, a hardtail fat bike. They sent us the e-Factor XR+, the electric version of their Factor. The XR version has longer suspension in the front—at 140mm versus 120mm—than the regular e-Factor+. It’s an aluminum-framed beast of a bike, using what they call their Stealth alloy, in which each tube and part is carefully designed to carry out a specific function and also achieve the lowest possible weight. The cockpit is pretty clean. Everything is where you expect it to be, including the SRAM Level brake levers that never failed us. Steering control for this bike comes from nice, wide Mondraker 760mm bars with a 31.8mm stem, and the tapered head tube sitting at a relaxed 67.5-degree angle. SRAM’s NX components are spec’d from stem to stern and handle the shifting in the 1×11 system with an 11-42t rear sprocket. Though it isn’t the EX-1 or Eagle, we like the NX. It works well and won’t break the bank, helping keep the price point of the bike down. Braking is also SRAM Level T, with a 200mm front rotor and 180mm rear. The bike has an OnOff Pija dropper post with up to 170mm of travel to keep the exclusive Mondraker Factor XR+ saddle out of your way when not needed. Electric assist comes from a Bosch Performance Line CX mid-drive motor. Because this is a mountain bike, it comes with the new e-MTB mode, which replaces Sport mode, offering an automatic switch from Tour mode all the way up through Turbo, step-lessly, based on the power input from your legs. Pedal harder, get more power. We love this setup and actually wouldn’t mind that mode spilling over into their on-road bikes. The SRAM GX derailleur and SunRace 11-42t cassette made sure we never ran out of gears and never missed a shift. Battery power comes from one of Bosch’s 500-watt-hour external battery packs. These replaced the 400-watt-hour packs from a couple of years ago with just higher energy density, so the form factor was identical. We expect that in the next year, the PowerTube battery will replace most of these across the industry. We’ve already seen previews of Mondraker bikes with them. Though we know people who will carry an extra battery with them on rides, most of the riders we know don’t own two batteries, let alone go on long-enough rides to require an extra. Display on this bike is the Bosch Purion, which integrates a small screen with a couple of buttons on the left side of the bars, so the mode buttons are in easy reach. The display shows your speed, what mode you’re in, battery power, range and other things can be selected. Toggling through the modes, there’s Off, Eco, Tour, e-MTB and Turbo. Overall, the suspension was so good that we never once locked out the fork. Though Walk mode is offered by Bosch, for when you have to push your bike up a hill, Mondraker has disconnected the mode. Some companies do this to comply with laws in various countries. In the U.S., it’s legal, but in some countries in South America, for example, it isn’t. Companies like Mondraker make it easier on themselves by making their sales of bikes standard worldwide to avoid problems, because recalls and fines are very expensive. It’s a shame, because it is nice to have it. If you have to push a 50-pound bike up a hill, it’s not bad to have a little help. The e-Factor is a trail bike aimed squarely at advanced riders who want an e-MTB with 27.5-inch-plus tires that can fly down (or up) the trail with ease. At a bit over $5000, though, it isn’t cheap by any means; it’s a really solid bike in this range. Just looking at the bike when you approach it, you can see that it looks longer and lower than most. It almost looks like a crouching cat. Like any Bosch-motored bike, a short press of the power button on the Purion display brings the machine to life. The e-Factor climbs like a champ, and we took it up our regular test trails, and on the ultra-steep stuff, the bike rolls up like it was nothing. Between the power of the motor, the plus tires and the well-designed suspension, it has no tendency to loop out or slide. The wheelbase is slightly longer than many bikes, despite the rear end being a bit shorter, which could have made it want to wheelie a bit when we didn’t want it to, yet it never did. Descents were made easy, like slicing through butter. This bike made us feel instantly comfortable. The Forward Geometry shifts your weight slightly forward, offering enough control that we were emboldened to go faster than usual and hang it out there a bit, and we never got into any trouble. We definitely feel that this bike could make a rider better. The Zero Suspension system works extremely well. Despite the modest travel spec on this bike, it can be set up to be as plush and forgiving as you want, but it may take a little experimenting. One of our riders bottomed out on normal sag, so he tried running the rear shock stiffer, and that worked. Others preferred a little softer ride and were able to without going all the way through the stroke. distributes your weight as you ride and climb around the bike. The range was good with the 500-watt-hour battery, and virtually identical using Turbo and e-MTB on the same trails. One of our test riders didn’t care for Turbo mode, saying it was way too powerful and said he felt that power delivery kicked in more naturally in e-MTB mode. We tend to agree. The e-MTB mode feels like it ramps up slowly as your legs provide more torque instead of instantly. Some like that about Bosch—the instant surge of power when it kicks in because the system monitors torque, cadence and speed over 1000 times per second. On descents, e-MTB mode works far better. You can lock into Tour, Eco or off instead, but we liked the control of e-MTB. We do wish Bosch would put the e-MTB mode separate from Sport to be able to lock that in, but that’s unlikely to happen. beneficial for the best ride experience. We found the e-Factor XR+ to be a really capable bike at a good price for what you get. It’s certainly the best five-ish-grand e-MTB we’ve ridden. The geometry is so good, the suspension setup is great and the power works so well with the bike. We loved riding it. If you’re an advanced trail rider looking for a bike that handles well, this one is worth a demo ride.